If you like to be served a little history with your cabaret, then come to this show which adds some special New York flavor to its café. 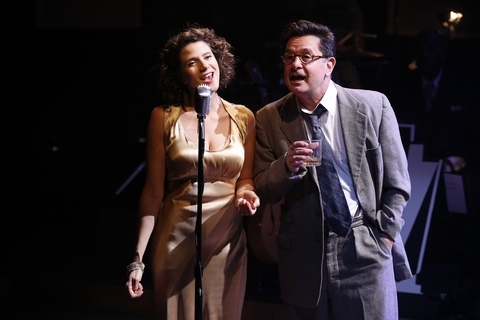 This holiday season the 59E59 Theaters is hosting a special cabaret, Cafe Society Swing, in tribute to a historic cafe which thrived back in the1940’s, one that defied conventional wisdom at a time when vanilla and chocolate didn’t mix and red was a very scary color. Known as the Cafe Society Downtown, it was the first club of its kind in New York City and possibly in the country to feature white and black artists performing on stage together before an integrated audience. Not only that, mixed couples were seen dancing and even leaving together. Shocking as this was back then, Cafe Society appealed to the elite and became the big hot spot in town. Even Eleanor Roosevelt, Paul Robeson and Errol Flynn were known to stop in. Proprietor Barney Josephson referred to it in his memoir as “the wrong place for the Right people” and it is this work that inspired the making of Cafe Society Swing which is as much about the club’s owner and his family as it is about the talent he brought to its doors. The Downtown club was an extraordinary place. Legendary for its jazz and blues, it produced a lot of stars: Lena Horne, Billie Holiday, Sarah Vaughan, Zero Mostel, Big Joe Turner, Count Basie, Carol Channing and Sid Caesar among them. Only a block away from its original location, the set for this unusual cafe so captures the mood of the place that the audience feels like they are really there. Artistic panels depicting murals that portray a satiric picture of high society like those that were specially-commissioned for the real cafe serve as a fitting backdrop. Seven musicians sit in front of the panels where they play a combination of strings, brass and drums. The eighth member of the band is Musical Director Alex Webb who takes command of the piano situated to the left of the stage. There are three vocalists who perform along side of him: Cyrille Aimée, Charenee Wade, and Allan Harris, who doubles as a Guitarist for the band. Everyone is dressed to the nines. To the right, actor Evan Pappas makes a very believable reporter, bartender and, in the last act, proprietor Barney Josephson himself. His role is pivotal because he tells the story of not only this notorious cafe but also of the remarkable man behind it. The show opens with a scene from 1948 in which a reporter looks up from his typewriter in a room milky with smoke to reflect on what he has just written about the tenth anniversary of Cafe Society Downtown which opened in 1938. It is Christmastime and the club’s owner, Barney Josephson, is getting some heat because his brother Leon, a Communist, has just been sentenced to jail after being convicted by the House Un-American Activities Committee for contempt of Congress. 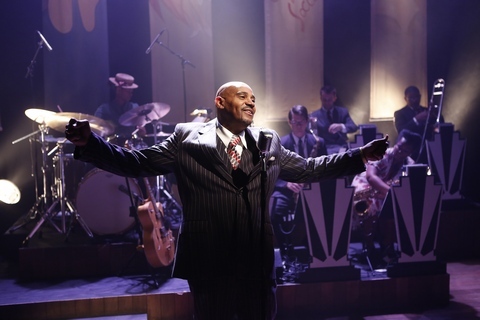 Also, Barney is accused of running a “Moscow-line night club.” Harris moves to the center of the stage and begins to sing Webb’s new song, “Cafe Society,” which celebrates the end of Prohibition and the opening of a club that not only welcomes good liquor with its food but one that defies the Jim Crow laws of the day. The reporter turns back to his typewriter and reads, “Barney Josephson is a sharp operator. He doesn’t put off honest, right-thinking Americans by lecturing them about Socialism. He’s more subtle. He builds a late night scene around swinging jazz and wise-cracking comics.” Harris then sings another of Webb’s new songs, “Rollin.” After a little more talk, soloist Wade breaks out in “What A Little Moonlight Can Do” and “All of Me” in a nod to Billie Holiday. The reporter rants on about the music industry being full of Reds and then Aimée, another soloist, sings a dreamy “Stormy Weather” and “Where or When” that would have made Lena Horne proud. The reporter goes on with his story about a poor shoe salesman who managed to live through the Depression and start up a small business at Sheridan Square, thanks to a $6,000 loan from his brother Leon, and how this small venture went on to become the pulse of the day for raw talent and draw in both high and low society alike. He writes that this salesman may have grown up on the wrong side of the tracks but that he was no heel. He was a man that wanted to change the world by bringing whites and blacks together and he didn’t let the hostility toward that kind of thing stop him. According to the reporter, the man even stood up to the mob. Also, he was full of ideas. Not only did he offer a platform for great jazz and blues, he added gospel to the mix. He never seemed to forget where he came from, either, because, as the reporter tells it, “habitués of his nightstop are greeted by a doorman in a ragged coat.” This is when Harris, accompanied by guitar, bass, trumpet, and drums, sings a very simple but moving “One Meat Ball.” The room becomes quiet except for the performers as everyone tries to envision being hungry with only one meatball to eat. If this performance doesn’t create an image of the times, nothing will. It is a very powerful moment in the show. The reporter starts talking again about the poor immigrant from Latvia who is the “all-American success story, child of Russian Jewish refugees who made good. He’s the ‘fellow-traveller’ who used to organize benefits for the so-called ‘Progressive Citizens of America’, whose brother helped smuggle Communists out of Nazi Germany before the war.” He adds, “He’s the music man with the habit of falling for the satin lovelies who sing at his club – when he isn’t encouraging them to perform for Russian War Relief.” As the reporter saunters across stage, drink in hand, musing that Barney doesn’t give him the time of day, all three soloists join together in singing, “Stalin Wasn’t Stallin,’” backed up by bass. The reporter then notices the place is thinning out, that there are “just a few late-night souls wondering if they’ll ever find their way home” and that it is closing time. Act Two begins with Harris singing “Wrong Place, Right People” backed up by the full band. Written by Webb, this is the theme of the society club, what separates it from the rest, and Harris does it justice. Pappas is now the bartender and has been with Barney since the beginning so he is full of stories and not afraid to tell them. He talks of the Depression, Socialism, and Barney’s phenomenal success. He also lets the audience in on a dream Barney has to bring over European talent to go with his wine and recounts a funny story about his attempt to lure Josephine Baker to his club only to find he could not afford her, even at a discount. However, he recalls a chanteuse by the name of Lucienne Boyer who comes to sing for him. This is when Aimée offers up a French number, “Parlez Moi d’Amour,” accompanied by piano, guitar and bass. The bartender continues with his stories and comments on some of the famous people who have frequented the club like Orson Welles, Charlie Chaplin, Langston Hughes, Gene Kelly, and Lauren Bacall. He also laments that the State Liquor Authority keeps breathing down his neck although he runs a good bar. After a few more songs including a delightful “Bad Girls Need Love Too” delivered by Wade and the full band, the bartender recounts a story that showed Barney wasn’t the only brains in the family. His brother Leon had a plan to create the first interracial housing complex in America right here in New York City. The Federal Housing Administration agreed to front half the money but Leon would have to come up with the other half so he drew Barney into the deal. The project was moving forward when Leon got called up before the House Un-American Activities Committee. This is when all three vocalists break out in a chorus of “Red Scare,” another song be Alex Webb, this one bringing attention to the hysteria that went on in those days. The bartender breaks the mood by saying, “With all that political stuff going on, boy did we need music.” He went on to talk about a new gal in town, Sarah Vaughan, and with that Wade lightens things up with a wonderful vocal interpretation of Cole Porter’s”What Is This Thing Called Love?”. A few more songs are sung and the bartender gets back to his story about Leon’s appearance before the Committee. He says that Leon does not answer their questions but admits to “fighting Hitler long before most Americans had even thought about it” and says that “By creating hysteria over Communism, this un-American Committee is trying to wipe out the social gains achieved under Roosevelt.” This does not go over well with the Committee. Not only that, his ties with his brother Barney and the infamous Cafe Society known for its Red sympathies leads to his incarceration and, in turn, ignites a fear amongst many in the entertainment industry as the Committee starts locking people up. The Housing Administration backs out of the project but houses do get built. It’s just that they end up being only for black people and so it goes. The bartender says, “It ain’t like the movies. Sometimes the bad guys win. Now I know we’ll sure as hell never have a black President.” How times have changed. In the finale, the bartender takes on the role of Barney Josephson who retrieves a letter from his pocket. It reads, “For the attention of Mr. Barney Josephson, proprietor. By the power invested in me by the State of New York, I hereby suspend the license of these premises, Cafe Society, One Sheridan Square, Greenwich Village, to sell intoxicating liquor pending investigation of alleged adulteration of same … Chair of the New York Licensing Authority … on this day, March second 1949.” McCarthyism has finally caught up with him and so Cafe Society Downtown closes after more than a ten-year run but it will never be forgotten and all it did to give great talents a platform can never be undone. The night ends with a little Billie Holiday in a song she once sang at the club, “Strange Fruit.” It is sung by Charenee Wade and so, after more than 20 songs and the unfolding of the story of Barney Josephson and his high society club, the show closes to a huge round of applause from a packed audience. 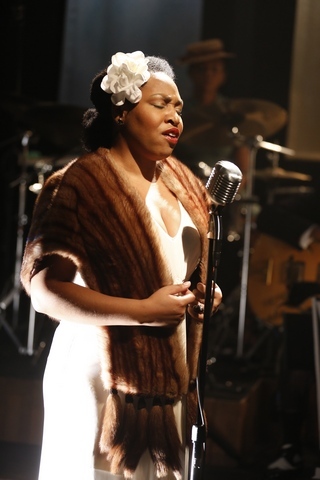 It is a great moment for cabaret and a moving tribute to an important moment in our history. It reminds us of where we have been and how far we have come. This show leaves us with a lot to think about and could not have been performed any better so it is necessary to acknowledge all of the players that made it such a smashing success. To that end, I lift up my drink to the rest of the band which, besides Webb and Harris, includes Mimi Jones on bass, Joe Boga on trumpet, Lucianna Padmore on Drums, Camille Thurman on Tenor Sax, Bill Todd on Alto Sax and Clarinet, and Brent White on Trombone. Simon Green was the director. The exquisite set and costumes were designed by David Woodhead and the lighting, which really set the mood, was designed by Maruti Evans. In her new play, actress/playwright Nicola Wren shows off a rare combination of talents. World premiere of one act plays by Neil LaBute, Eric Lane and Claire Zajdel on relationships at a tense moment in their development. An unhappy couple check into a hotel for 24 hours in order to unleash their disappointments on each other. Billy Crudup’s tour-de-force performance is a potent reminder that all you need for good theater is the actor’s voice--as well as a good script, of course.